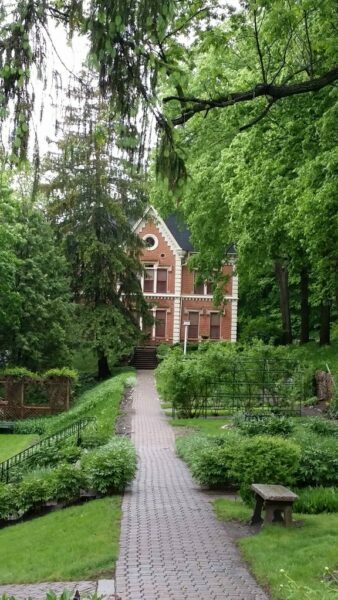 We attended the New Ulm Instameet in New Ulm, MN hosted by Pickles Travel and New Ulm, Minnesota. This was our first Instameet. We love visiting New Ulm and do so often as it is a charming little community that is just 25 miles west of where we live in Mankato. Our check-in point was the Convention Visitors Bureau in New Ulm. Upon arrival , Sarah Warmka with the New Ulm Chamber and Greta from Pickles Travel greeted us with goody bags for attending, name badges and a little information for the day. 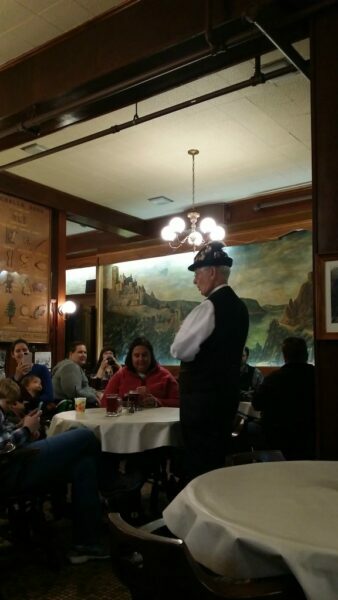 The only scheduled events were a group photo and a tour of Schell’s Brewery. Other than that, we were free to explore the great city of New Ulm any way we wanted! Since we’ve visited New Ulm many times, our strategy was to take in sites and landmarks that we haven’t experienced before. We easily filled the day with new adventures! Our day ended long after the event hours (noon to 5 pm) because we had so much fun and didn’t want the day to end. 100% rain would not ruin our fun! New Ulm is a town that is very proud of their German Heritage and culture. This is evident all around town from the business, houses, parks and the people! It’s part of why we like going there so much. Here is a chronological recap of how we spent our time during the New Ulm Instameet. A to Zinnia Floral & Gifts is a store that I have driven by many times and have never stopped. They offered free truffles for showing our New Ulm Instameet Badge and we do like free things so this was reason enough to check it out! This shop is an absolute must if you’re in New Ulm and like shopping for unique and pretty things. The store is beautiful and has a variety of gifts, clothing, flowers, books, greeting cards, candles, etc. It’s like being on a treasure hunt, There is fun and beautiful things everywhere you turn. It made me want to go home and start freshening things up with decor and cute little trinkets. Dusty is not fully on board with that yet 🙂 I now know that we’ll be stopping in to see what’s new at A-to-Zinnia each time we’re in New Ulm. Maybe I can slowly work on that redecorating project I’ve just created for myself. 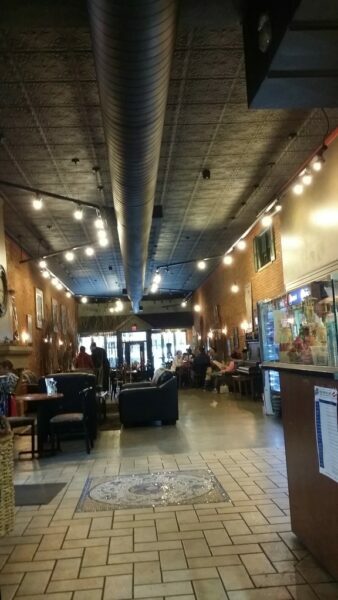 Lola is one of our favorite places to eat in New Ulm. Here is a blog post we wrote about eating there in the past as well as their Food Truck that visits Mankato in the summertime! We stopped in for a free cup of coffee that they offered by showing the New Ulm Instameet Badge. We both opted for Minnesota Sunrise. A great cup of coffee to warm us up on a rainy day. Thanks! We highly recommend stopping there for a bite to eat the next time you’re in New Ulm. Cool wall decoration on exposed brick inside Lola- An American Bistro. It’s a comfortable atmosphere. I was familiar with the name, Wanda Gag, but didn’t know much beyond that. Wanda Gag is the author of the classic children’s book, Millions of Cats but that is not all her and her family are known for! Our tour guide gave us a nice history of the house, and definitely left us wanting more! The Gag House has been restored to look like it did when the Gag family lived there. It’s also listed on the National Registry of Historical Houses. Here are some things we found interesting: The house has multiples of Seven. For instance, the family had 7 children. There are 7 walls in the dining room. There are 7 different shapes of windows in the house. The patriarch, Anton, was forward thinking and had installed a sky light in his photo studio. Anton’s children loved when their father did still life drawings of fruit, they especially loved when he painted grapes, because they knew they would get to eat his subject of grapes when he was finished! Culture, peace and religious tolerance were the qualities Anton considered necessary for happy living, a philosophy he revealed in his decoration of Turner Hall on south State Street. He took the greatest pleasure in this project. One of his still-life paintings remains at Turner Hall. Anton was 14 when he arrived in the United States from Bohemia in 1873. The following year he came to New Ulm where he found work at the estate of August Schell, founder of the brewing company that remains in operation today. Schell became Anton’s friend and mentor, sending him to art schools in Chicago and Milwaukee for several months. This was his only formal art training. In a significant contribution to history, Anton interviewed survivors of the Dakota Conflict of 1862 to recreate events in oil paintings. These have been reproduced in history books. His painting, The First Battle of New Ulm, was exhibited at the 1893 World’s Fair in Chicago and is hung at the Minnesota State Capitol. A panorama of Dakota Conflict scenes, painted by Anton and his partners, is in the Minnesota Historical Society collection. It was a wonderful tour and I’m intrigued to learn more about them. Original artwork done by Wanda Gag’s father, Anton. 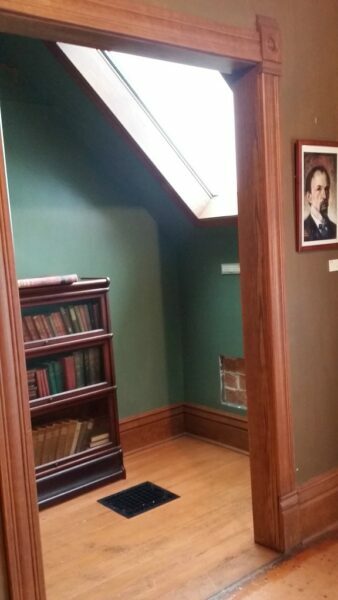 He also installed the skylight, something that was not typical for the time period. 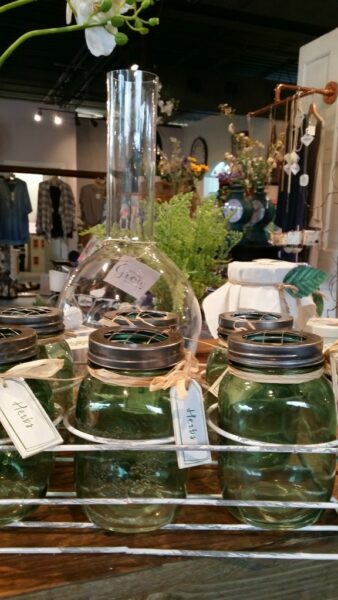 Inspired Elements for Life & Home is a store that occupies the former Lambrecht’s location, a store that was in New Ulm for many, many years. 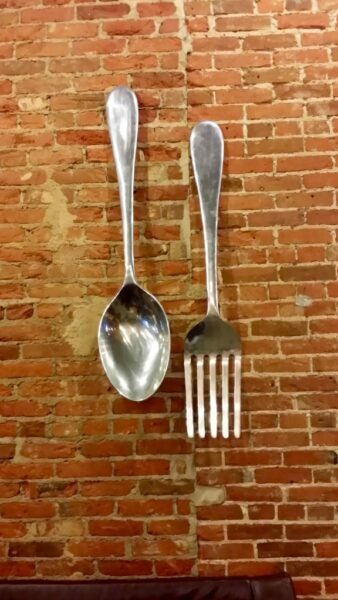 They offer a great variety of gifts and decorative elements for your home. 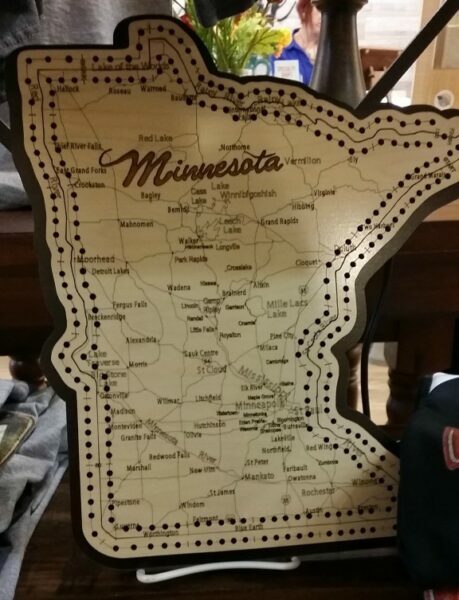 They also have a nice selection of Minnesota products which are really on-trend right now Minnesota Proud!! We stopped here because they were offering a free Pop Socket or ear buds with the New Ulm Instameet Badge- thank you!! Dusty and I each chose a Pop Socket and they’re awesome. 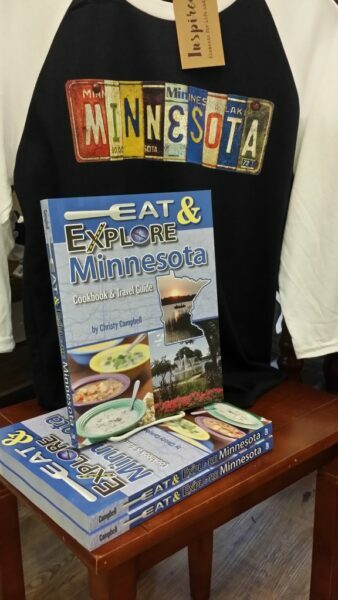 We also found a treasure to take home, a cookbook called Eat & Explore Minnesota Cookbook & Travel Guide by Christy Campbell. It’s a really cute store with lots of fresh and fun things for your home. You’ll find something for yourself or for a gift. 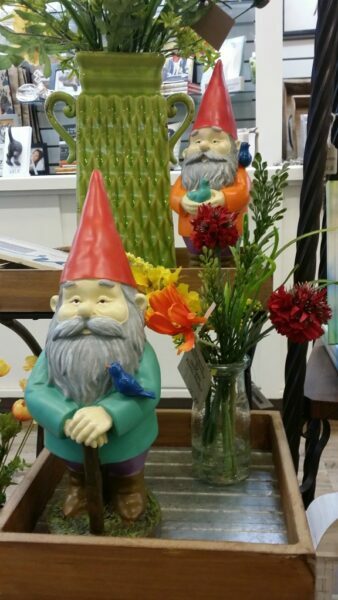 Cute little Gnomes can be found everywhere in New Ulm! 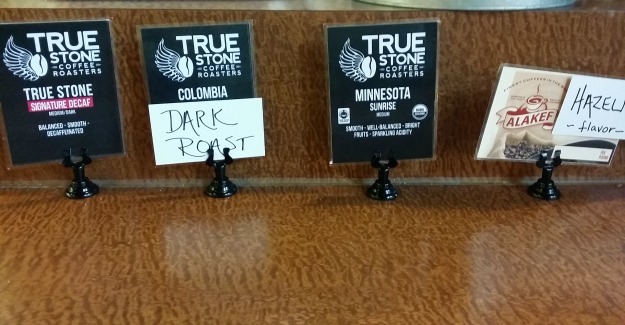 Cute Minnesota product at Inspire. We left with the cookbook. We had no idea that the oldest bar in Minnesota was located in New Ulm. Founded in 1856 by the Turner family, the bar also has the oldest gym in the state of Minnesota. The Turners believed in the concept of a sound mind & body and were gymnasts. Gymnastics are still offered in the building upstairs from the restaurant & bar, otherwise known as a Rathskeller, which means a restaurant or bar in the basement. 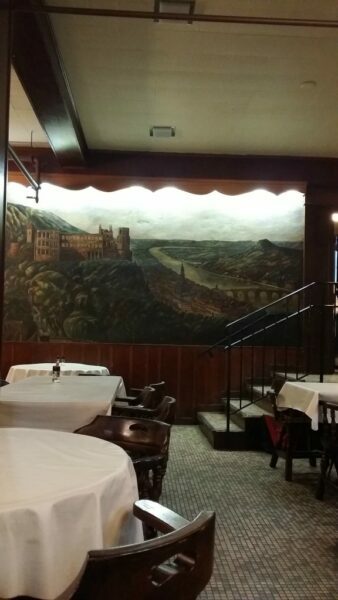 There are over 70 feet of beautiful hand-painted murals of Switzerland, Italy and Germany on the walls. It is a fun experience, indeed! We were in for a special treat while we enjoyed our free beer for showing our New Ulm Instameet Badge. Thanks!! The Narren of New Ulm made a special appearance and we all had a photo with them. Neither Dusty or I have ever hear of Narren. 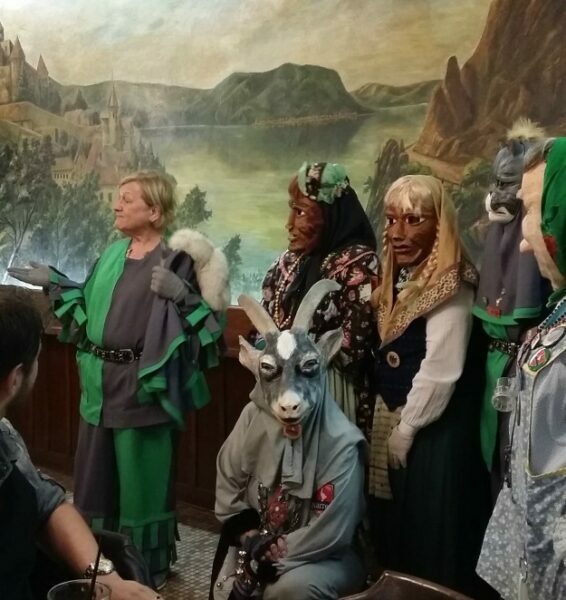 The purpose of the Narren is to spread German culture through stories & entertainment. 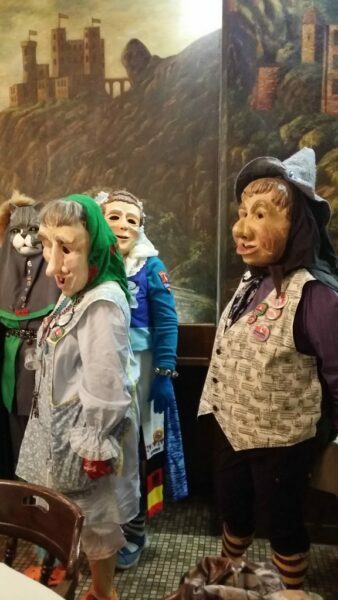 Their masks are carved of wood, some even by master wood carvers in Germany, and represent ‘characters’ of the community. This was one heck of a fun crowd of women. Again, this is a place we’ve driven by for years and have never stopped. 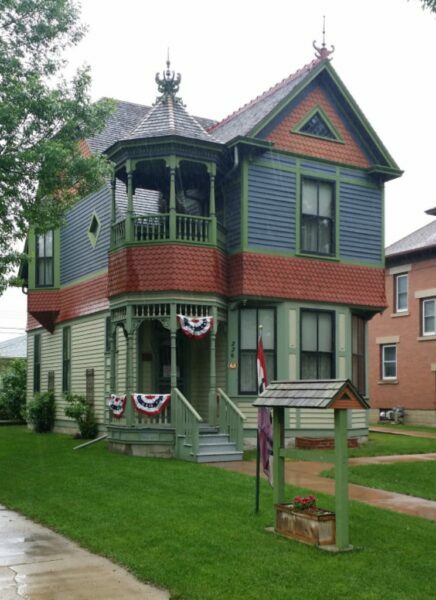 The museum is 3 floors rich in New Ulm History and it’s listed on the National Register of Historic Places. 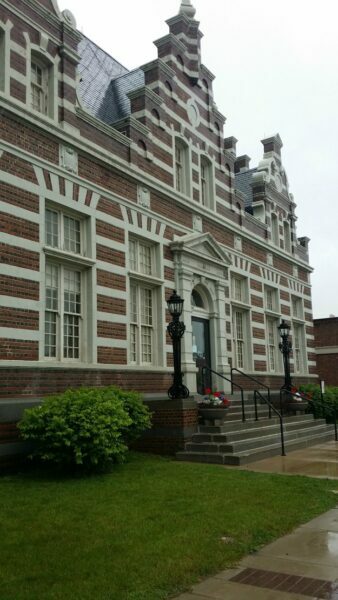 The German-Renaissance style brick building was built in 1910 and is something that catches your eye when you drive by. The BCHSM is one of the most photographed buildings in town. We very quickly went through the floors, knowing there was no way that we could begin to properly visit. We stayed for a short 20 minutes or so and decided it would be best to come back when we have more time to dig into the history. 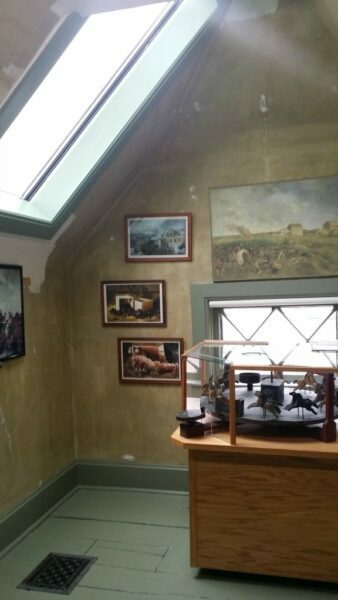 A few observations, the Historical Society Museum. It’s done very well. You will get a full history of whatever theme is on display. They offer self-guided tours with video explanation at each of the artifacts. The staff couldn’t be happier to discuss all things New Ulm with you. 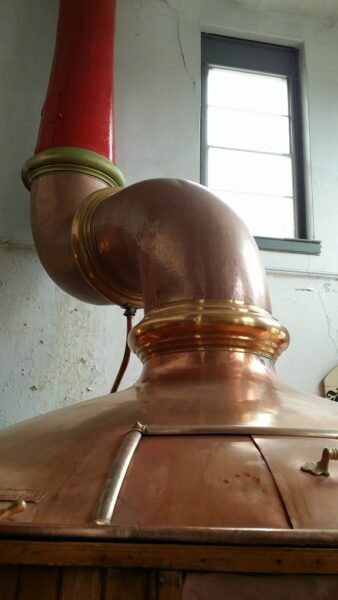 Brewery Tours: Fridays: 1:00 & 3:00. Saturdays: 12:00, 1:00, 2:00, 3:00, 4:00. Ticket sales begin at 11:00 | Sundays: 1:00 & 2:30. 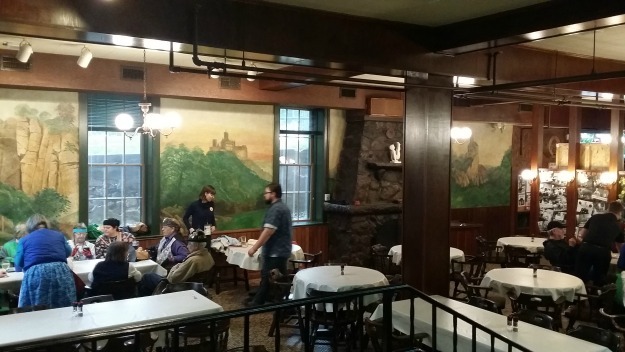 A tour of August Schell Brewing Co was part of our New Ulm Instameet. This is a tour we’ve taken before but we were happy to take again! 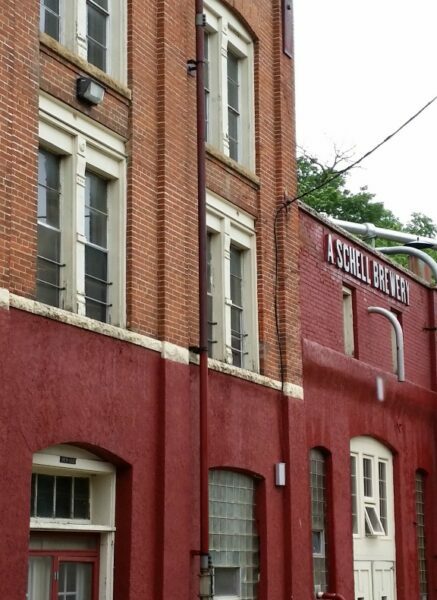 Schell’s is a 5th generation brewery and is the 2nd oldest Brewery in the nation. August Schell Brewing company has always specialized in German-style lagers and we think they’ve nailed it. The grounds are simply majestic. 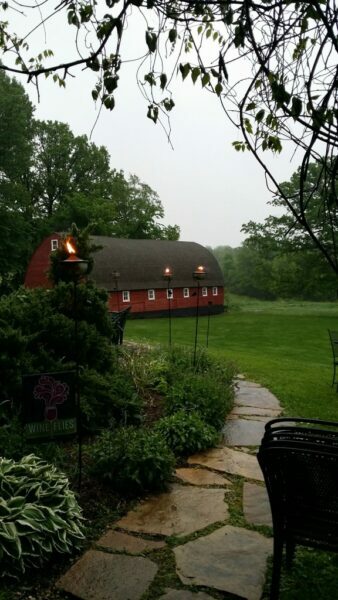 There are family gardens, the Cottonwood River, gift shop and a Rathskeller Tap Room. We sampled 6 biers: Light, Firebrick, Goosetown, Hefeweizen, Grain Belt Lock & Dam and their Pilsner. The Hefeweizen is only available from May August and we were excited to have that beer! We’re also big fans of the Goosetown & Firebrick so were happy to taste those again. 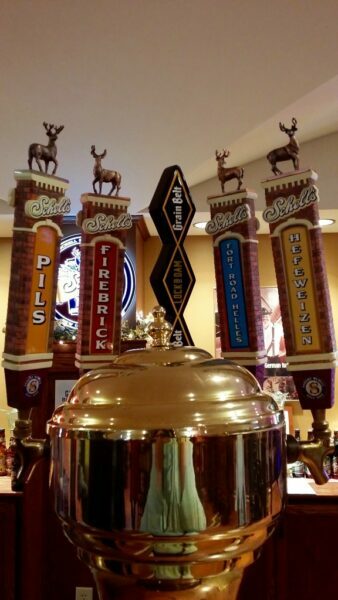 Schell’s beers can be purchased in Iowa, Minnesota, North & South Dakota and Wisconsin. Lush gardens and mansion on the property of August Schell Brewing Co.
Morgan Creek Vineyard offered a free glass of wine to those with the New Ulm Instameet Badge and we were happy to stop there on our way home. We have visited this winery previously but it was nice to be back and reminded us that we’d like to visit more often. Morgan Creek Vineyard has won a ton of awards, and it’s quite obvious why. The vineyard is set in a beautiful valley with a creek running through it. Plenty of space to walk around or enjoy a fire pit and pond. It’s just a delightful way to spend the time and that’s not even including inside. It’s a small tasting room and they also have a menu where you can order a light lunch or dinner. 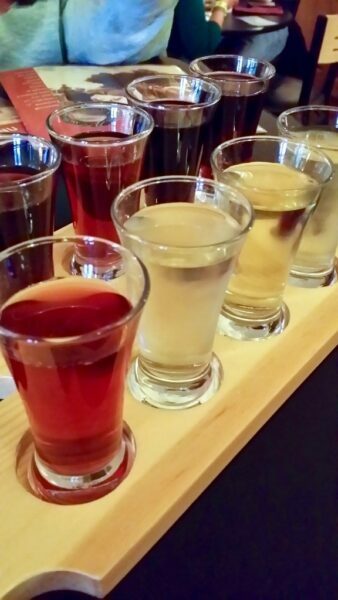 Dusty and I decided to order 2 flights of wine so that we could sample all of the wine before settling on our free glass of wine. We both chose the same glass, the Colure. Very good. Thanks!! 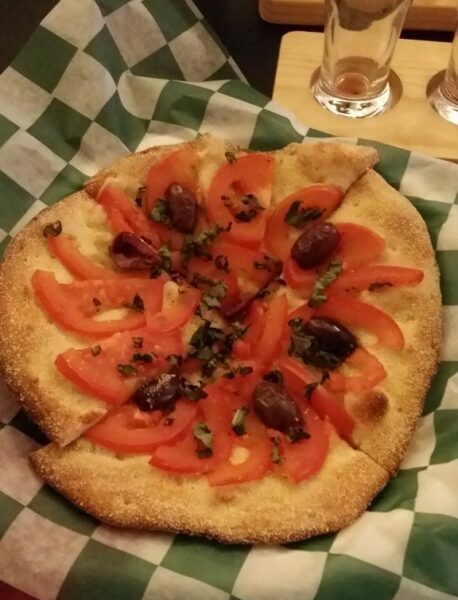 We ordered a flatbread pizza and enjoyed jazz music from the Jim McGuire Trio Band. It was just delightful. The rain had subsided to a drizzle for the first time all day so we advantage to get outside and enjoy the fire and explore a bit. We took a walk down by the creek and saw where the grapevines are growing before heading home. This Greek Flatbread hit the spot with our wine flights. We were unaware that World War 1 had such a lasting effect on the city of New Ulm. Honestly, it was just not something we had given much thought to before the tours. It was amazing to hear how it affected the locals. The U.S.- Dakota War of 1862 was another event that we didn’t know touched New Ulm. We’re quite familiar with Dakota 38, as it’s a very dark part of Mankato’s history. We had no idea how the U.S.- Dakota War of 1862 affected the neighboring town of New Um. We heard about these two events during our tours of the Wanda Gag House, the Brown County Historical Society Museum and Schell’s Brewery. It was quite fascinating, and a bit embarrassing to not have known more about it. Over the course of the day we struck up conversation with other Instagrammers. It’s so fun to talk to people who love to travel & explore our great state (and beyond)! Dusty and I talked with people who traded tips on editing photos, more breweries to visit, recommendations to try out VRBO and Air B & B for upcoming trips. It was a wonderful day and we hope to find other Instameet events to attend! It’s such a great way to learn about any town or subject. And that’s a wrap on the New Ulm Instameet. This was such a delightful day! It helps to have a partner in crime with the same outlook adventure & spending the time! Kudos to Sarah from New Ulm and Greta from Pickles Travels for organizing a wonderful day of exploring & Instagram. It’s quite obvious that a lot of planning and thoughtfulness went into the event. New Ulm is a community rich in history & good people who love sharing their town with anyone who wants to visit. Have you ever attended an Instameet? We’d love to hear if you enjoyed it as much as we did. Your article makes me want to visit New Elm! 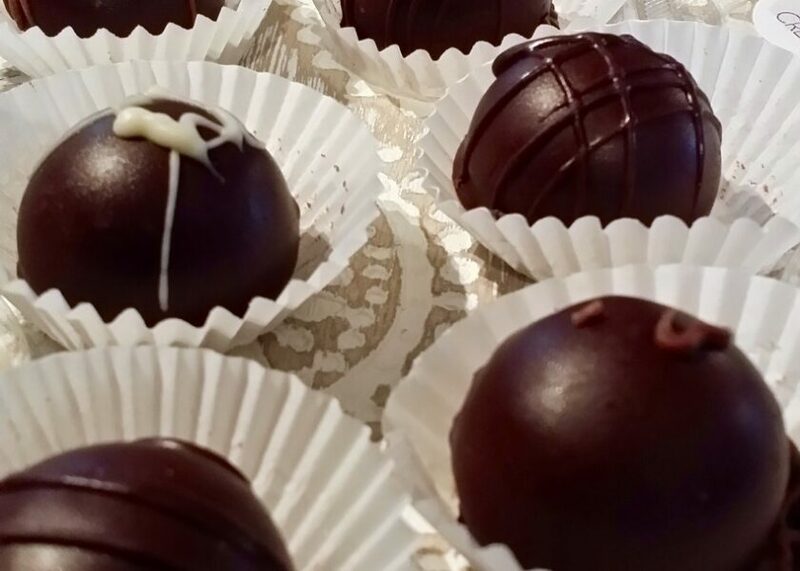 I would love to try the chocolate truffles, and the Wanda Gag house is so cool! I love to see anything historical. Maybe I need to visit Minnesota again soon! I meant to say New Ulm! Sorry! Stacey- New Ulm is absolutely worth the trip! So fun. Let me know if you do, we’re 20 minutes away! New Ulm is beyond adorable! It’s a real gem. We did pack it in! The bar was set pretty high on our first Instameet, indeed. The Wanda Gag House does look really pretty! We really enjoy stopping at Lola- love the vibe! It looks like you guys had a great time. I was bummed that I couldn’t make it out there this past weekend. Thanks for sharing! We had a blast! We hope to attend more in the future. Would have been fun to meet up! No doubt! Would have been fun to meet. Let us know if you hear of an Instameet – we enjoyed it so much! I’ve never been! Looks like it would be a fun day trip! Holly- you would love it! It would be a very fun way to spend the day. If you do go, let me know and I’ll let you know some other places you should check out! Have never been to New Ulm. Looks like an awesome way to explore the city. We love German food – will have to visit soon. Jeni, you would love it! Great food and it’s just a cute, little town.